I had a rare treat last night, taking my two sons to Fenway for a Red Sox game. After surprising them with the news that they were going to a Red Sox game, not Daddy’s softball game, we bade the girls goodbye and drove into town. Ostensibly this treat was a birthday present for my almost-ten-year old, but it was really just an awesome thing to do. To say that it was a perfect night for baseball would not have been doing it justice. It was cool, dry, breezy, and the Red Sox won handily, the boys got pretzels and lemonade, and I may have had a Green Monstah IPA. Just sayin. As per official seat upgrade regulations, we spent the beginning of the game in our original seats, moved down to the right field box, and then ended up sitting in the first row at the visitor’s on deck circle by the end of the game. And, true to form, somehow the birthday boy ended up with a baseball that he got from the Mariners ballboy. To say that my other son was jealous would be a vicious understatement- if you look at this picture you will see him scrunching his face into an almost-smile, barely concealing his inner rage. I get it. But unlike in Jerusalem of days gone by, senseless hatred between brothers did not ruin the day, and by the time the boys got home at 11:15 the car ride, brotherly antics, and time playing Candy Crush and Bad Piggies had healed all wounds. I don’t know how this happens, but in our last two trips to Fenway, we’ve gotten three baseballs. And it’s even more insane- in our last two trips to the New Hampshire Fisher Cats in Manchester we have gotten seven baseballs, and last time we were in Portland we got a ball from the Sea Dogs game. It must be making up for the fact that as a kid I never got a ball. Ever. The closest I ever came was in 1985, at my first game at Fenway, when a foul ball hit the green pole next to me, and in 1992, when a ball rolled over my dad’s foot in the Kingdome in Seattle; I still can’t believe he didn’t get it. For some people, baseball is no longer America’s pastime, and pundits chirp about the ascendancy of football to the number one sport in the country. I couldn’t disagree more. I’ll take three-hour games, the aura of Fenway, and the crack of the bat over never-ending TV timeouts and traffic on Route One. 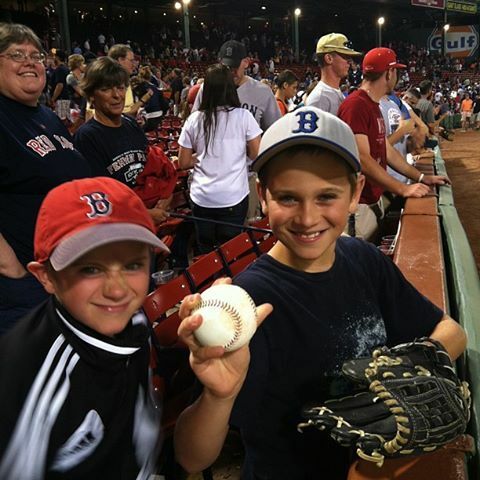 And, more compelling than anything is that just getting a baseball will put a smile on a kid’s face like nothing else.